Heat the oil in a pan. Sauté the onion and garlic. Add the aubergine and sauté for approx. 5 mins. Add the pepper, courgette and tomato and sauté briefly, season. Add the herbs, cover and simmer over a low heat for approx. 30 mins. until just soft. Remove the herbs. Mix the oil and herbs, set aside. Season the racks of lamb. 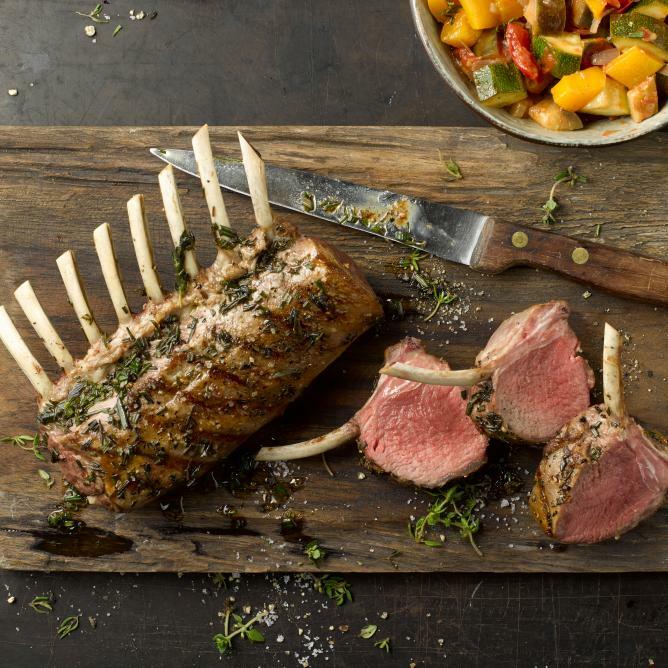 To grill: Charcoal/gas/electric grill: Grill the racks of lamb over/on a medium heat (approx. 200°C) for approx. 10 mins. on each side, cover and leave to rest for approx. 5 mins. Slice the meat, plate up, drizzle with herbed oil. Serve with ratatouille.